How far does your accountant go for you? Do they compile your accounts? File your tax return? How about wash your car? 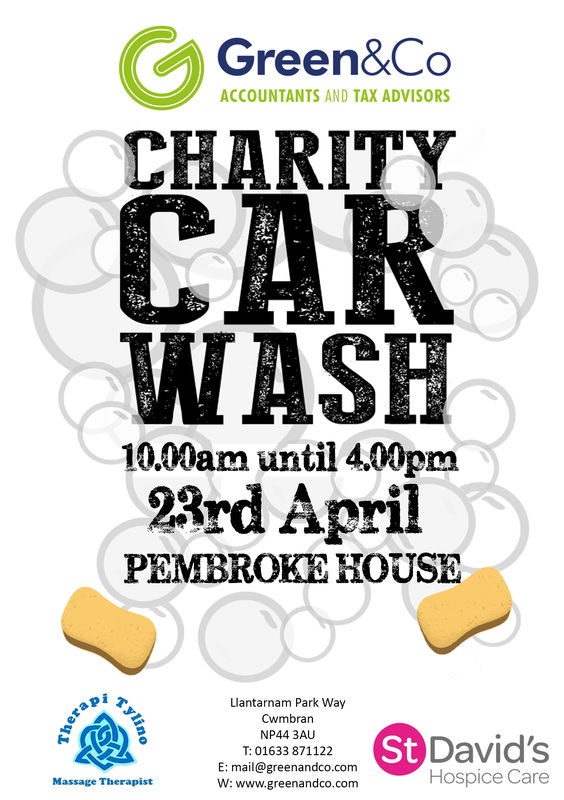 On Thursday 23 April 2015 Green & Co will be spending the day cleaning cars in the hope to raise funds for St David’s Hospice Care. For a donation, we will wash the outside of your car and can even offer a massage as you wait, courtesy of Roger Daniels of Therapi Tylino. Come along, relax and feel great knowing that it’s all for a great cause! Ottimo Digital Limited – for printing a banner to advertise the event. Brandnucreative Limited – for designing the artwork for the banner. Therapi Tylino – for coming along and offering massages for our clients as they wait. GP Auto Services – for sourcing materials for the day. D J Decorators Limited – for starting the donations off by agreeing to fetch their fleet of vans down for a generous donation! Reblogged this on Green & Co Farms.